1. Brooks is a price action trader with 27+ years of experience. 2. He is an active day trader, trading off the 5 minute chart. He trades the entire day. 3. He has a purely technical approach, relying totally on price action with just a few moving averages. 4. His approach is entirely rules-based; he not use any discretion and does not consider relying on intuition. 5. He states his setups have worked for decades and continue to work. Brooks' analysis relies on measuring movements (i.e. retracements), gauging the strength of trends, and analyzing candlesticks. 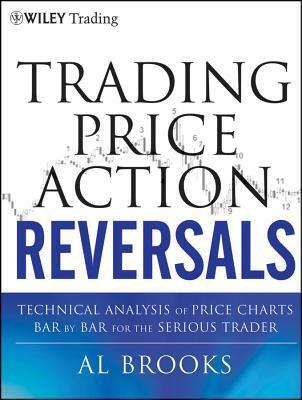 Brooks has authored a number of books on trading. Interested traders may find it worthwhile to check out his page on Amazon. 3. Go short, targeting the low of the day. To be clear, Brooks' approach to price action trading is much more thorough; this strategy is just one tool in his arsenal. “If you trade Countertrend, you are gambling, and although you will often win and have fun, the math is against you, and you will slowly but surely go broke. Countertrend setups in strong trends almost always fail and become great With Trend setups..."
the material is very useful for me. because I do not find this material in the bookstore. My description: in my opinion, some of the best books regarding algorithmic trading are not books wrote for this intention. This one is for me a great example and read, there are lots of new ideas that can be used in quantitative finance area. I like too much the "prediction paradox" described below, since when we talk about future no one has monopoly on truth. 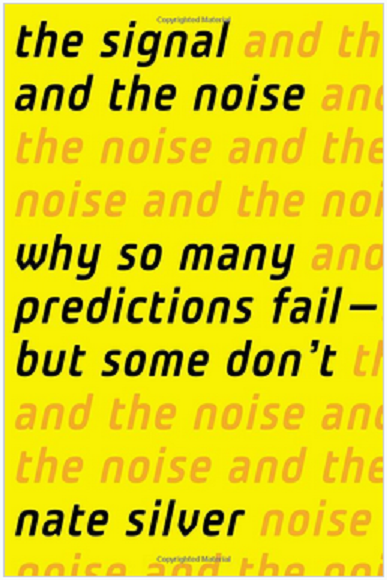 Amazon description: "Drawing on his own groundbreaking work, Silver examines the world of prediction, investigating how we can distinguish a true signal from a universe of noisy data. Most predictions fail, often at great cost to society, because most of us have a poor understanding of probability and uncertainty. Both experts and laypeople mistake more confident predictions for more accurate ones. But overconfidence is often the reason for failure. If our appreciation of uncertainty improves, our predictions can get better too. This is the “prediction paradox”: The more humility we have about our ability to make predictions, the more successful we can be in planning for the future." an interesting thread. of all the files, I still do not understand about the article I read. Wiley actually has some really good books in Finance. Every advance in computer architecture and software tempts statisticians to tackle numerically harder problems. To do so intelligently requires a good working knowledge of numerical analysis. This book equips students to craft their own software and to understand the advantages and disadvantages of different numerical methods. Issues of numerical stability, accurate approximation, computational complexity, and mathematical modeling share the limelight in a broad yet rigorous overview of those parts of numerical analysis most relevant to statisticians. In this second edition, the material on optimization has been completely rewritten. There is now an entire chapter on the MM algorithm in addition to more comprehensive treatments of constrained optimization, penalty and barrier methods, and model selection via the lasso. There is also new material on the Cholesky decomposition, Gram-Schmidt orthogonalization, the QR decomposition, the singular value decomposition, and reproducing kernel Hilbert spaces. The discussions of the bootstrap, permutation testing, independent Monte Carlo, and hidden Markov chains are updated, and a new chapter on advanced MCMC topics introduces students to Markov random fields, reversible jump MCMC, and convergence analysis in Gibbs sampling. 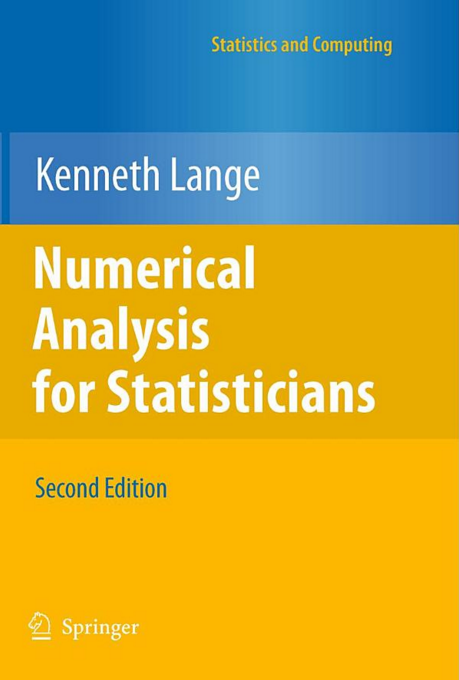 Numerical Analysis for Statisticians can serve as a graduate text for a course surveying computational statistics. With a careful selection of topics and appropriate supplementation, it can be used at the undergraduate level. It contains enough material for a graduate course on optimization theory. 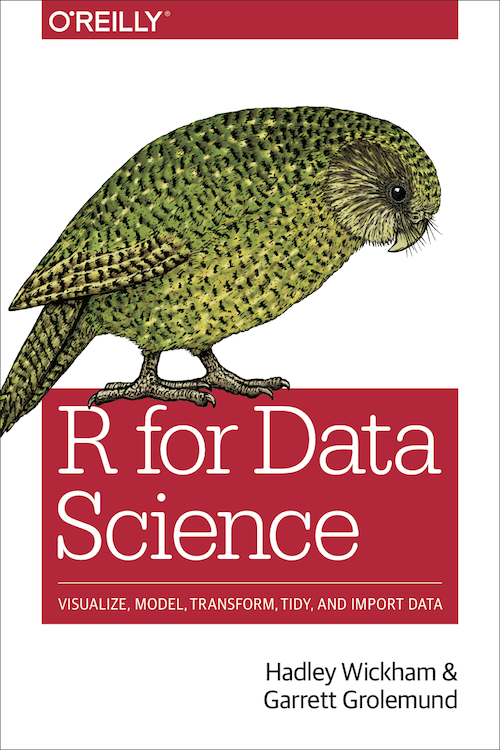 Because many chapters are nearly self-contained, professional statisticians will also find the book useful as a reference. Kenneth Lange is the Rosenfeld Professor of Computational Genetics in the Departments of Biomathematics and Human Genetics and the Chair of the Department of Human Genetics, all in the UCLA School of Medicine. 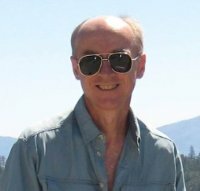 His research interests include human genetics, population modeling, biomedical imaging, computational statistics, high-dimensional optimization, and applied stochastic processes. Springer previously published his books Mathematical and Statistical Methods for Genetic Analysis, 2nd ed., Applied Probability, and Optimization. He has written over 200 research papers and produced with his UCLA colleague Eric Sobel the computer program Mendel, widely used in statistical genetics. Alpha Pages: You took great issue with Michael Lewis’ claim that the market is “rigged.” Why? Irene Aldridge: On the Michael Lewis topic, I suppose I am most disappointed in the pay-for-play quality of the book. Even the fastest best-selling writers can tell you that they are only capable of writing 15 pages per day, at best. To write a 300-page book, [is] a five-month process, at a bare minimum. Incidentally, at the time Mr. Lewis’s book was released, the trading venue around which much of the book revolves, has been in existence for, wait for it, exactly five months! In other words, Mr. Lewis began to write the novel about his great protagonists and its creation prior to the launch of this trading venue at the center of this book—I really don’t see how he could have covered this in depth. [It appears to be an] elaborate marketing campaign for this trading venue. In other words, the book is marketing masquerading as a fair markets discourse. For a writer like Lewis, stooping so low is a complete disgrace. Markets have moved a long way toward fairness since then, so most of his criticism is completely unfounded. AP: Is high frequency trading taking the heat for problems caused market structure or regulations? IA: From what we are seeing, this HFT pre-hedging that boils down to front-running [may have] unfortunately become common practice following the Volcker and Dodd-Frank rules. There still exists a FINRA rule that encourages brokers to avoid front-running, but FINRA is a self-regulatory organization, and the consequences of not following its rules [may not be so harsh]. While most of ABLE Alpha clients have the permission to access the markets directly and, as a result, avoid front-running, many smaller entities are not so lucky and end up losing money. I do not believe that this is what the regulators had in mind when they designed the laws, but these are the unintended consequences. AP: There is an ongoing argument over whether HFT is a net liquidity maker or taker as opposed to traditional market makers? IA: I was just presenting at the Princeton Quant Trading conference, where a fellow speaker, [from a] prominent broker discussed how they are forced to spend money to build systems that monitor the number of zeroes human brokers put at the end of their orders simply because brokers so often come to work hung over and unable to focus. Well, needless to say, hangovers do not happen to computers. 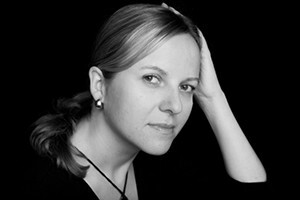 Overall, the computers are considerably cheaper, more reliable and less demanding than human brokers, so there is absolutely no doubt in my mind that the computerized trading technology, known as HFT, will replace most of the presently-human trading operation at brokers in continuing the digital revolution observed elsewhere in the society. AP: Will the size of HFT be self-correcting? Will algorithms exploit inefficiencies until they’re gone? One of our products is the HFT Index, science, not hear-say, based [on a] real-time estimate of aggressive HFT participation in electronic markets of customer choice. According to our estimates, activity level of aggressive HFTs by volume averages 15% to 20% in most markets, although intraday it may spike up 100%, or drop to 0%. According to the HFT Index, many highly liquid securities have the lowest HFT participation as a percent of overall volume, seldom exceeding 15%, while some other instruments are dominated by the aggressive HFTs. Painting the entire market with a wide 50% HFT brush gives little insight into what we and our clients are actually seeing. Financial markets are undergoing rapid innovation due to the continuing proliferation of computer power and algorithms. These developments have created a new investment discipline called high-frequency trading. Despite the demand for information on this topic, little has been published to help investors understand and implement high-frequency trading systems—until now. 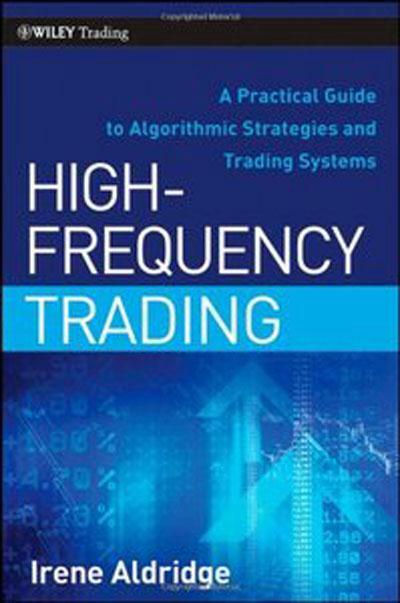 Written by industry expert Irene Aldridge, High-Frequency Trading offers the first applied "how to do it" manual to building high-frequency systems.Covering sufficient depths of material to thoroughly pinpoint issues at hand, High-Frequency Trading leaves mathematical complexities to their original publications, referenced throughout the book. Along the way, this reliable resource skillfully high-lights numerous quantitative trading strategies—from market microstructure and event arbitrage to deviations arbitrage—and puts the creation and management of portfolios based on high-frequency strategies in perspective. High-frequency trading is a difficult, but profitable, endeavor that can generate stable profits in various market conditions. But solid footing in both the theory and practice of this discipline are essential to success. Whether you're an institutional investor seeking a better understanding of high-frequency operations or an individual investor looking for a new way to trade, this book has what you need to make the most of your time in today's dynamic markets.